Stephen Moutray MLA, Chair of the Assembly and Executive Review Committee talks about the Committee’s recent visit to the Althingi Parliament, Iceland as part of its review into ‘Women in Politics and the Northern Ireland Assembly’. The Icelandic Government has for many years implemented very systematic steps to introduce and to promote gender equality in all areas of society. Indeed the government has had special legislation in place to ensure equality between woman and men since 1976. To further promote gender equality the government has ran a four year Gender Action Programme which includes a detailed plan of action and the estimated funding required to develop specific projects to examine and tackle gender issues and to increase participation. For the past five years, the Global Gender Index published by the World Economic Forum has ranked Iceland first in terms of political empowerment, with just under 40% of all parliamentary seats held by women. Given that the Northern Ireland Assembly has only 22 female MLAs, making up just 20% of all MLAs – we were obviously keen to find out more about the initiatives and strategies employed by the Icelandic Parliament which has seen the participation of women remain so markedly high. As well as dedicated Government strategies and initiatives, the Icelandic political parties have also developed policies to increase the participation of woman, particularly through the use of voluntary party quotas. My AERC colleagues Trevor Lunn MLA, Caitriona Ruane MLA and Paula Bradley MLA took the opportunity to speak to Ossur Skarphéoinsson MP from the Social Democratic Alliance of Iceland, Lineik Anna Saevarsdóittir MP from the Progressive Party and Svandis Svavardóittir, MP from the Left Green Parliamentary Group. You can listen to their audio interviews here. If you are interested in finding out more about the Review into Women in Politics and the Northern Ireland Assembly you can find out more information on our Committee webpage. 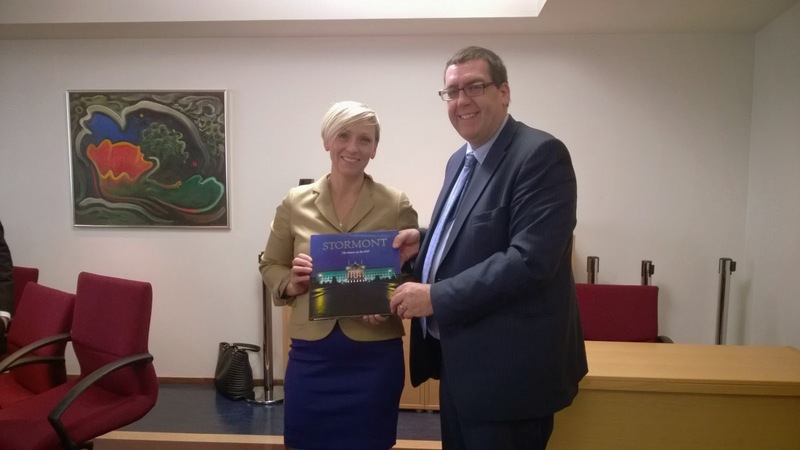 Chairman of the Judicial Affairs and Education Committee with a book on Stormont.